Lady Moura departed her homeport of Monaco for Germany last October, where she spent a few months at Blohm + Voss getting some routine maintenance. Unfortunately she needed some hull repairs this past May after running aground off Cannes during the Cannes Film Festival. 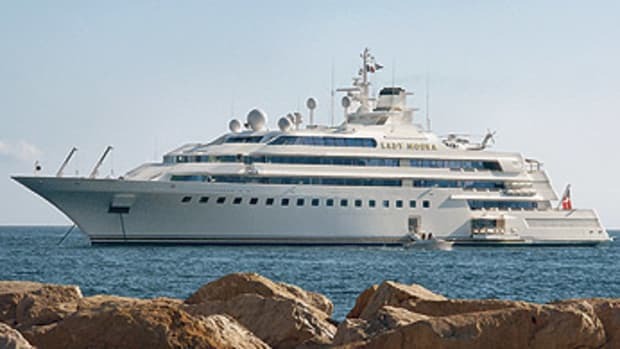 She’s had the same owner since launch: Nasser al-Rashid, a former chief engineer to the Saudi royals. He gets to enjoy one of the coolest features we’ve ever seen on a yacht: a virtual beach deck, created when a large hatch in her side lowers to just above the waterline, allowing crew to take out beach chairs, tables, and the like. This article originally appeared in the August 2007 issue of Power & Motoryacht magazine.